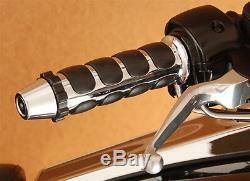 KAOKO Motorcycle Cruise Control Harley Davidson with Torpedo Shape End. (Incl matching left hand side Bar-End Weight). Kaoko Cruise Controls are purpose-built for a variety of motorcycles over 600cc. They consist of a friction nut that is integral with a replacement handlebar-end weight. To install, attach the bar-end weights and firmly tighten the central retaining screw. Greatly reduces rider fatigue and strain on hand and wrist. While cruising, rider is able to remove hand from throttle grip, throttle opening will remain as set. Very simple to operate, even with heavy winter gloves. High quality, compact and durable design, super smooth action. Takes less than 5 minutes to fit. Very little maintenance is required. Less wear and tear on throttle cables and linkages. Can result in reduced fuel consumption. KaokoT Safety Warning : The KaokoT Cruise Control is an aftermarket accessory. Any misunderstood, abused or incorrectly installed motorcycle accessory is a safety hazard that could cause injury or death. It's the rider's responsibility to understand the operation and purpose for which the KaokoT Cruise Control is designed, namely, for cruising, only when safe to do so. At all other times the control should be disengaged. The KaokoT Cruise Controls are to be used only by experienced and responsible riders. The item "KAOKO Cruise Control for Harley Davidson 1 handlebars Chrome Torpedo shape" is in sale since Thursday, July 20, 2017. This item is in the category "Vehicle Parts & Accessories\Motorcycle Parts\Other Motorcycle Parts". The seller is "demop_holdings" and is located in DURAL, New South Wales. This item can be shipped worldwide.